What should you do if you encounter someone choking on food? This is understandable because we frequently hear of celebrities performing or having performed on them a Heimlich maneuver and saving or being saved from choking to death. In addition, we have descriptions of individuals relating their own stories of lives saved. 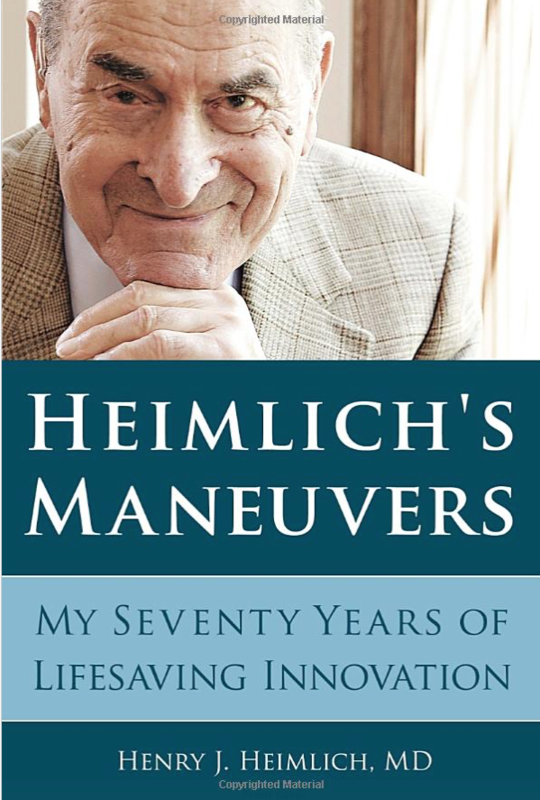 For example, in May of 2016, 96-year-old Dr. Henry Heimlich, widely credited as the inventor of the eponymous abdominal thrust procedure, made headlines around the world when he reportedly performed it on a fellow retirement home resident in Cincinnati. Surprisingly, despite the widespread belief that the Heimlich maneuver is the scientifically-affirmed treatment of choice for choking victims, there is only anecdotal evidence for its effectiveness as well as its dangers and there is no scientific consensus on the best approach to a person who is choking or has foreign body airway obstruction (FBAO). US was choking on a foreign body, usually food ,and that 3900 individuals were dying from foreign body airway obstruction (FBAO) a year. Slapping choking victims on the back. Heimlich states in the 1974 article that the procedure was adapted from “experimental work “with four 38-pound beagles. 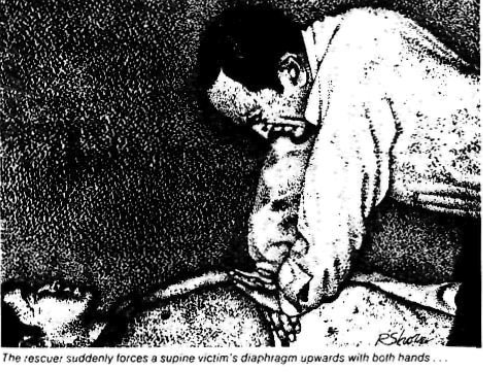 Shockingly, Heimlich, in this article (subsequently picked up and promoted by the lay press) proposed to all Americans that they begin an experiment on helpless choking victims to see if his newly developed idea was of any benefit. He requests in the last lines of this monumental communication that Americans help him gather information from the experiment. Four 38 pound beagles-The experimental work supporting an unsupervised, unregulated national experiment on choking victims! After being given an intravenous anesthetic, each dog was “strangled” with a size 32 cuffed endotracheal tube inserted into the larynx. After the cuff was distended to create total obstruction of the trachea, the animal went into immediate respiratory distress as evidenced by spasmodic, paradoxical respiratory movements of the chest and diaphragm. At this point, with a sudden thrust. I pressed the palm of my hand deeply and firmly into the abdomen of the animal a short distance below the rib cage, thereby pushing upward on the diaphragm. The endotracheal tube popped out of the trachea and, after several labored respirations, the animal began to breathe normally. This procedure was even more effective when the other hand maintained constant pressure on the lower abdomen directing almost all the pressure toward the diaphragm. We repeated the experiment more than 20 times on each animal with the same excellent results When a bolus of raw hamburger was substituted for the endotracheal tube, it, too, was ejected by the same procedure, always after one or two compressions. This “experimental work” seems to have been sloppily done and would not have passed muster through a legitimate current day peer-reviewed scientific journal. It seems more like the observations of an 18th century scientist than a 20th century one. Here are a few of the red flags I see that suggest either these experiments weren’t really done or that they need to be repeated with better documentation or by an investigator who is unbiased as to the outcome. There are no measurements recorded. Of any kind. Important data was not recorded: What anesthetic was utilized? What was the position of the animals? How long between experiments?. How many “more than 20 times” were the animals choked.? How big was the hamburger bolus? A year later Heimlich was apparently emboldened by reports of the successful application of his now namesake maneuver and his “special communication” ,published in JAMA, in October of 1975 reiterated his previous publication with a near identical description of the experiments on the four 38 pound beagles. He added some more details to these experiments. For example, we learn the beagles were anesthetized, with thiamyial sodium given intravenously. A cuffed, No. 32 endotracheal tube, the lumen plugged by a rubber stopper, was inserted under direct vision through the mouth into the larynx. The cuff was distended with 3 to 4 ml of air, causing total obstruction of the trachea, simulating a bolus of food caught in the human larynx. The animal immediately went into respiratory distress, as evidenced by spasmodic paradoxical respiratory move- ments of the chest and diaphragm. At first, the rib cage was manually compressed in an attempt to increase the intrapulmonary pressure and expel the bolus. This procedure was unsuccessful. 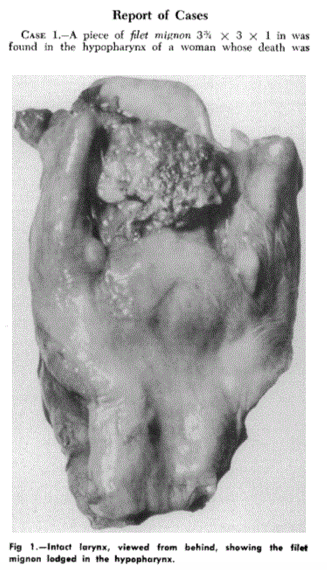 It was later realized that the compressibility of the lungs by this technique was inadequate due to the rigidity of the chest wall. Furthermore, any increase in intrapleural pressure would be dissipated by depressing the diaphragm. At first, the rib cage was manually compressed in an attempt to increase the intrapulmonary pressure and expel the bolus. This procedure was unsuccessful. It was later realized that the compressibility of the lungs by this technique was inadequate due to the rigidity of the chest wall. Furthermore, any increase in intrapleural pressure would be dissipated by depressing the diaphragm. Subsequently, I pressed the palm of my hand deeply and firmly upward into the abdomen of the animal a short dis- tance below the rib cage, thereby pushing against the dia- phragm. The endotracheal tube (bolus) popped out of the trachea. Interestingly, there is no published, peer-reviewed paper verifying the research that Heimlich claims to have done in developing this procedure. And according to his son, Peter M. Heimlich, his father’s archives at a University of Cincinnati medical library include no documentation of the research on the beagles. The Chest Thrust (Guildner Maneuver): A Superior Approach? Two years later, Charles W. Guildner, an Everett, Washington anesthesiologist and American Heart Association (AHA) consultant, published the results of experiments he performed on six human volunteers which concluded that chest thrusts were superior to abdominal thrusts in generating air flow out of the trachea and presumably more effective at clearing foreign bodies obstructing the airway of choking victims. Guildner’s results are supported by a study by Audun Langhelle of Oslo, Norway, published in 2000 by the journal Resuscitation. Langhelle compared peak airway pressure with standard chest compressions versus Heimlich maneuvers done by emergency physicians in cadavers with simulated complete airway obstruction in a randomized crossover design. Mean peak airway pressure was significantly lower with the Heimlich maneuver than with the chest compressions. If ineffective repeat back blows and manual thrusts until they are effective or until the victim becomes unresponsive. Host Johnny Carson demonstrates the Heimlich maneuver on actress Angie Dickenson while Dr. Henry Heimlich watches on April 4, 1979..
For Heimlich, having his maneuver incorporated in US first aid guideliness only two years after he introduced it wasn’t enough. He then embarked on a ten-year media campaign he called “back blows are death blows” in which he accused the AHA and ARC of putting lives at risk because they continued to recommend that treatment. In 1986, with support from Dr. C. Everett Koop, U.S. Surgeon General under President Ronald Reagan, Heimlich got his way. The AHA removed backblows from its guidelines and endorsed the Heimlich maneuver as the sole approach to the choking victim. The ARC followed suit. In 2005, the American Red Cross, after reviewing the scientific literature concluded that back blows, abdominal thrusts, and chest thrusts were equally effective for FBAO. Heimlich, ever vigilant of the primacy of his maneuver, condemned this to the Cincinnati Enquirer in a 2013 interview. A review of the scientific literature suggested that back blows, abdominal thrusts and chest compressions are equally effective. Additionally, the use of more than one method can be more effective to dislodge an object. These findings are consistent with those of international resuscitation societies. The Red Cross certainly isn’t discounting the use of abdominal thrusts. But we include back blows, abdominal thrusts and chest compressions in our training because there is no clear scientific evidence to say that one technique is more effective than the others when treating a choking victim. Chest thrusts, back blows/slaps, or abdominal thrusts are effective for relieving FBAO (Foreign Body Airway Obstruction) in conscious adults and children >1 year of age, although injuries have been reported with the abdominal thrust. There is insufficient evidence to determine which should be used first. These techniques should be applied in rapid sequence until the obstruction is relieved; more than one technique may be needed. Unconscious victims should receive CPR. The finger sweep should be used in the unconscious patient with an obstructed airway only if solid material is visible in the airway. There is insufficient evidence for a treatment recommendation for an obese or pregnant patient with FBAO. Although chest thrusts, back slaps, and abdominal thrusts are feasible and effective for relieving severe FBAO in conscious (responsive) adults and children ≥1 year of age, for simplicity in training it is recommended that abdominal thrusts be applied in rapid sequence until the obstruction is relieved. If abdominal thrusts are not effective, the rescuer may consider chest thrusts. It is important to note that abdominal thrusts are not recommended for infants <1 year of age because thrusts may cause injuries. 2. one poor quality LOE 4 study suggests that for conscious adults with an obstructed airway, abdominal thrusts generate higher peak airway pressures when delivered when the victim is supine as compared to seated and that back blows do not generate any significant change in airway pressure. Clearly, there is a dearth of evidence to support basic life support treatment guidelines for this important problem. In the resuscitation guidelines of medical organizations in Australia and New Zealand, the Heimlich maneuver is warned against as unproven and to be avoided due to “life-threatening complications” associated with its use. Instead, first aid authorities in those countries recommend first performing a series of backblows followed by, if necessary, a series of chest thrusts, the treatment studied by Guildner (1976) and Langhelle (2000). Thus, it is clear the Heimlich maneuver was recommended by Henry Heimlich for general usage without any human clinical studies to support its safety and efficacy. With Heimlich’s aggressive promoting of the technique it became the recommended way to treat choking conscious individuals despite experimental evidence showing it inferior to chest thrusts and no controlled human trials to support its safety and effectiveness. Australia and New Zealand, countries free of Heimlich’s influence, do not recommend the Heimlich maneuver for choking victims. It is entirely possible that chest thrusts are a safer and more effective maneuver for removing foreign bodies from choking victims. Since Dr. Heimlich died in December, 2016 perhaps the organizations that teach CPR can reevaluate their recommendations in this area without fear of public shaming or retribution. Given the uncertainty in the treatment of choking victims and the number of deaths a national trial comparing chest thrusts versus abdominal thrusts as the initial procedure should be initiated as soon as possible. N.B. In Part Two of this analysis of the Heimlich maneuver we will review the evidence of the harm the Heimlich maneuvers have done over the years.